Want to make a “Million Dollar Feature”. However (Shh! Secret coming), you do not need $1,000,000 to make a “Million Dollar Feature” for you can do so with only $200,000-$300,000 (Shh! See Hot Tip Below). You can execute (A) a 3-week (18-day shoot) Production, with (B) a 4-week Pre-Production to scout, cast, rehearse, crew and design properly, with (C) a 10-week Post-Production period to include a (C-1) 5-week picture edit, (C-2) 2-week sound edit, (C-3) 3-day ADR session, (C-4) a 3-day Foley session, with (C-5) a 1-week Mix/M&E to ensure a (C-6) color-corrected print or DCP from your lab containing an orginal (C-7) music score. Now, imagine what you could do (produce) with an extra $200,00 and had $300,000-$500,000 cash which, during marketing, when asked “What’s the budget?”, you would likely say it’s a “$1-2 Million Feature” or even a “Just-Under $2-3 Million Feature”. And if you had a $500,000-$700,000 cash which, once again, when asked “What’s the budget?”, you would likely call it a “Just-Under $3-5 Million Feature”. Again (See Hot Tip Below). The No-Budget ($10K-$20K) and Micro-Budget ($50K-$100K) scripts (85-90 pages) are self-written (Final Draft or Celtx) with a story, like Hitchcock’s “ROPE”, happening during 90-minutes of real-time. 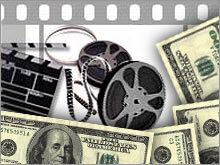 With $10-100K you are a Hyphen (Writer-Producer or Writer-Director) and writing the script. With $200-300K you can afford to hire someone (aka: Writer-For-Hire) to write the script. Further, with $200-300K you can allocate $10K-$25K to hire a writer to get a Treatment ($1-2K/week for 8-10 weeks), Beat Sheet (40-50 scenes), with 2 Drafts (90-100 pages), that has a story with structure (aka: Beginning, Middle, End) that takes place, not in real-time, but over an extended period with great dialogue, 3 sub-plots, and a crisis with resolution. Plus, within the script, you can afford 3-4 locations (the Cemetary, the Haunted House, the Police Station and…) all 4-5 blocks of each other, with 6-8 actors, to include 1 semi-name ($10-25K for 1 Day) to play role #4, and 10-12 pages EXT-NIGHT location (likely the Cemetary) scheduled for the last days of the shoot. This is no longer a No- or Micro-Budget script. This is an Independent Low-Budget script. Another option, since you can budget $25,000 for script procurement, is to purchase ($25,000 purchase price with a $5,000 non-refundable option) a locally produced stageplay, that you have seen and love (you must love it… not just like it a lot… you must love it), with 3-4 actors, great dialogue and character interaction that can be shot in 2-weeks at one-location. 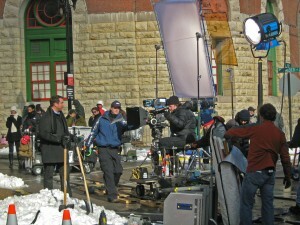 With $200-$300K cash you can afford crew, equipment, food and location rentals for 3-weeks. Further, if desired, you can sign with an Above-The-Line guild, the Screen Actors Guild (http://www.sagaftra.org/ultra-low-budget-agreement), for professional actors. This agreement (aka: *contract) states for 90-Minute Narratives (Hollywoodese for a Movie), with budgets of approx $200,000, you can hire SAG Actors for as little as $100/day. FOOTNOTE: * Please-Please-Please read the Ultra-Low-Budget Contract carefully and understand debts, financial obligations, deferrals and deferments before you quickly think the agreement has you only obligated to the $100/day. 3-week shoot has 18-Shooting Days. 18-Shooting Days, with a 90-100 page script, has a Shooting Schedule of 5-6 Pages/Day. To Direct and get coverage and allow actors a 2nd take, to enhance their performance, with a schedule of 5-6 pages/day, you must schedule 1 Page in-the-can every 2 hours. Directing 1 scene/page every two hours, with 5-6 setups/page/scene, translates to 25-30 setups/day with 20-25 minutes/setup. Further, directing 1 scene/page every 2 hours, with 5-6 setups (Master Shot, 2 Medium Shots, 2 Closeups, 1 Establishing shot) still needs numerous 3-5 cutaways framed as closeups. Lighting, 1 setup every 20-25 minutes, means 10-15 minutes to move and adjust the lights. Lighting Director (aka: Gaffer) has barely time to light with a single Key, 2 Backs, and if super fast 2-3 Fill Lights. Your Cinematographer (aka: Director of Photography) is allocated enough money to rent two 4K camera packages (Reds “Yes”, Alexa “Maybe”), with a package of 4 Prime lenses and 1 10:1 Zoom lens, with a support staff of 2 Camera Operators, a 1st AC, a 2nd AC and a DIT. Sync Sound will be excellent, for you can afford a quality soundman, with his own equipment and Van, that includes a Boom/Mike Man. Schedule. Actors. Direct. Cameras. Lights. Sound. Crew… After permits, insurance & locations…What’s next? Food, or fuel, for your cast and crew, during 3-weeks, entails a (A) Breakfast supplied at $75/day by your Craftservice Person, (B) Lunch at $10/person supplied by either a caterer or a local restaurant who brings it to the set, (C) Snack table at $25/day supplied by the Craftservice Person, and, on the days shooting also EXT-NIGHT you have a second meal (pizza, burgers & fries) supplied again by the Craftservice Person with the assist of two PAs with a SUV or Van. With $200-$300K, and a 3-week shoot, you can allocate $80-90K for crew salaries. DP ($10K), Camera Operator ($5K), 1st AC ($4K), DIT ($4K), PM/LP ($7K), PC ($5K), Sound ($5K), Boom ($2K), Gaffer ($5K), Best Boy Electrician ($3K), Grip ($3.5K), Best Boy Grip ($3K), Hair/Makeup ($5K), Assistant ($2.5k), Script Supervisor ($4K), Craftservice ($2.5K), PA 1-4 ($1K/each), PD ($7K), Set Decorator ($4K), Paint-Carpenter ($3K), etc. With $80-$90K, for a 3-week shoot, you hire quality-experienced individuals for your key slots of DP, PM, PC, PD, Sound, Gaff & Grip and film school grads for the support slots. HOLLYWOOD LIES: In the early ’80s, 2-years after arriving in Hollywood, I got my first job as a PA (42 years old and a PA at $125/week) on a Roger Corman (aka: “King of the Bs”) feature. 1-year and five “Just-Under-a-Mill” features later I realized that as, now Line Producer, I never saw more than $300,000, usually $200,000, in cash spent, for a 3-week shoot (prep & post included), to make what Mr Corman called a “Just Under-a-Mill” Feature Film. The Hot Tip is to make sure that you always remember that whatever budget you read or heard about of any film is ALWAYS A LIE. HOLLYWOOD LIES: They either inflate budget to create a larger perceived value or in the No- or Micro-Budget world they deflate the budget to make the movie appear to be more of a darling. Aug 19-20 or Dec 9-10, 2017… 100% Fact & 0% Theory… Enroll. Graduate. Why Wait?